The agency announced the Wednesday suspension of computer-based tests, or CBTs, only a few hours after it had halted the administration of the digital exam on Tuesday. The state Education Department pulled the plug Tuesday on computer-based English Language Arts exams and announced a statewide suspension of the digital tests on Wednesday — all because of technical difficulties. Tuesday was the second potential day of computer-based tests in grades three through eight, with schools using the exam vendor Questar Assessment Inc. Glitches also occurred during last year's test season, and the new troubles brought immediate calls from the New York State Council of School Superintendents, the state's largest teacher union and others for reevaluation of the Education Department's contract with Questar. Questar has dispatched additional staff around the state to provide technical assistance to schools, the department said. The test vendor reported that more than 84,000 test sessions statewide were successfully submitted Tuesday. In addition to declaring Wednesday a "CBT non-testing day," the Education Department said it will extend the time period during which districts can give the exam. Before the test's suspension, districts had chosen two consecutive days from Monday through April 8 to administer the digital test. As of Tuesday night, the agency had not publicly released a new CBT end date. The technical failures come at a time when districts' adoption of the digital test has jumped markedly. The digital version of the ELA is being given to elementary and middle school students in nearly one-quarter of the Island's districts, and the Education Department said more than 25 percent of all schools across the state had committed to the computer-based test. It was not immediately clear how many Long Island schools that are giving the computer-based exams were affected on Tuesday and also will suspend that testing Wednesday. At least 21 districts across Nassau and Suffolk counties were slated to give the digital tests in at least some grades on at least one of the two days, according to a Newsday survey that drew responses from 92 of the 123 systems that administer the ELA. In the Islip district, Superintendent Ellen Semel said some students started taking the digital ELA on Monday, and no problems were reported. But in the morning session Tuesday, it took students a half-hour to an hour to log in, and some were booted off after they had logged in, she said. In addition, when students were finished, they could not submit their tests, she said. The students would hit “Submit test” and an exclamation point would appear, and educators had to resubmit the exams. This year is the district's third to use computer-based tests in some grades, and some students were scheduled to take the digital tests Wednesday, officials said. The Syosset school district sent a communication to parents that it had issues with the exams, which were being given in grades five through eight Tuesday, according to information the district earlier supplied to Newsday. The William Floyd school district also confirmed there were technical issues with the digital exams, which were to be given in grades six through eight on Tuesday and Wednesday. Jill Gierasch, superintendent of the Mattituck-Cutchogue district, said the district had made a "concerted effort to have parents allow their children to participate in these assessments. It is unfortunate that we experienced these unanticipated glitches." "There were server time-out errors and students and teachers were unable to log into the system. This required patience and additional time allotted for the test," Gierasch said. "Although it appeared that some students received a message that they were unable to submit answers, administration was able to verify their answers were indeed submitted on the administrative end. No work was lost and all students were able to successfully complete the assessment." The superintendent noted that the extra verification efforts took more time and added, "For districts that might not have had experience with CBT or had the technical support on-site of the testing locations, we can understand how this may have been very challenging." The New York State Council of School Superintendents, in a statement, noted that it has supported moving to computer-based tests, and eventually to adaptive testing. New York State United Teachers, the state's largest teacher union, said it had received reports of "widespread failures." "Despite claims to the contrary, clearly the state has not taken the actions needed to ensure that technological issues will not unduly burden students taking these already flawed state exams on computers," the group said. The state PTA, which has questioned the entire computer-based test program, also called on the state to review its contract with Questar. "We hope today's problems do not affect children and know that districts and SED will do their best to ensure that," the group said in a statement. "Questar's failure put unnecessary stress and anxiety on children, and that is not acceptable." 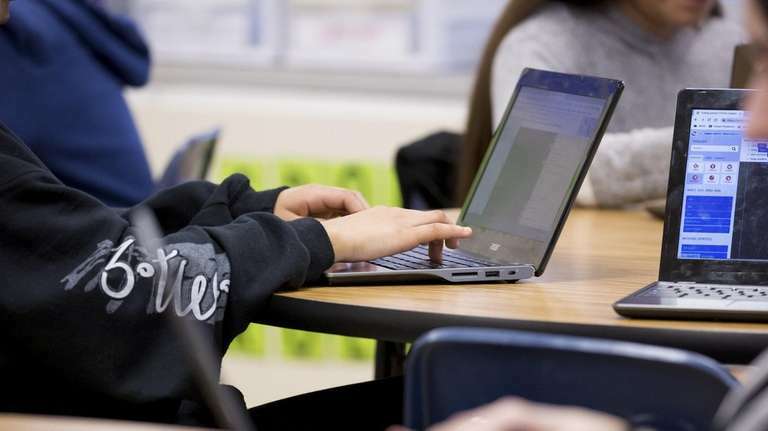 Last year, there was a technical problem on one ELA test day that caused delays for some students, who had difficulty logging in and connecting to the network. The Education Department required Questar to analyze the problem and devise a corrective plan. Questar developed that technical improvement plan, the department has said, and was required to institute a series of changes to improve its capacity to handle the CBT administration "without any disruptions." The majority of schools across the Island and the state still are giving the traditional paper-based exam in some grades, if not all, on two consecutive days of the district's choosing from Tuesday through Thursday. Some districts in Nassau and Suffolk counties are offering the ELA exam solely on the computer. Some are giving both types, the digital one for some grades and the paper-based test for others. During the test season, more than 1.1 million students across New York in grades three through eight are expected to sit for the state ELA and math exams this month and next. About 200,000 of those are in the Island's schools. Districts are required by federal law to give the exams in those grades annually. Statewide, the number of schools participating in computer-based tests has grown from about 4 percent in 2017 — the first year they were offered — to more than one-fourth of schools statewide this year for both the ELA and math, the Education Department said. The department set a goal to have all state assessments given in grades three through eight taken on computers by 2020. Last year, 27 schools in 19 public school districts on Long Island gave the digital ELA in some grades, according to state figures. This year, that has risen to 66 public schools in 29 districts — 20 in Suffolk and nine in Nassau, according to the Education Department. Beginning in the spring 2013 test season, the state tests sparked a grassroots boycott movement both on the Island and statewide. The increase in student opt-outs swelled significantly in 2015, driven by parent and teacher criticism. Many parent activists say the tests do not accurately measure student achievement and too much class time is devoted to test preparation. Boycotts of the exams were expected to continue this week. Last year, nearly half of Long Island students who were eligible to take the ELA refused to do so, according to a Newsday survey that drew responses from 115 districts. Jeanette Deutermann, lead organizer of the LI Opt Out movement, said in a statement Tuesday, "The reported major issues with computerized testing once again this year is no surprise. The continued incompetence of our State Education Department and the Questar testing company reinforces our call to parents to refuse to participate in this failed testing system." Districts that were administering the digital test in at least some grades on Tuesday and Wednesday, according to information the school systems earlier supplied at Newsday's request, were: Bayport-Blue Point, Bridgehampton, Elwood, Farmingdale, Fishers Island, Floral Park-Bellerose, Islip, Longwood, Merrick, Mattituck-Cutchogue, Northport-East Northport, Remsenburg-Speonk, Riverhead, Sayville, South Huntington, Syosset, Tuckahoe, West Babylon, West Islip, Westhampton Beach and William Floyd. Thirty-one of the 123 districts on the Island that give the ELA did not respond to Newsday's survey regarding their test dates and which grades are taking the computer-based and/or paper-based exams.